Spend an idyllic day sailing around the incredibly beautiful island of La Graciosa on a sleek catamaran. 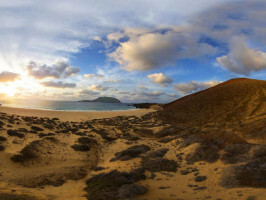 This volcanic island to the north of Lanzarote is part of the Chinijo Archipelago and is a real haven for nature lovers. Sail right around this tiny island on a luxury catamaran as you enjoy amazing views and the incredibly clear turquoise waters. 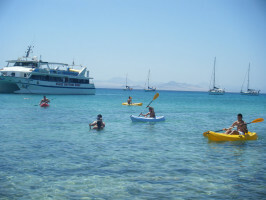 We'll drop anchor in a secluded bay for you to go swimming and then enjoy a leisurely lunch on board. The fun starts as we board the catamaran at the port of Orzola on Lanzarote. As we make the crossing over to La Graciosa enjoy some Spanish omelette and drinks and admire the spectacular views of the neighbouring islands of Montaña Clara, Alegranza, Roque del Este and Roque del Oeste. Once we arrive at La Graciosa you'll have some time explore the island's sleepy main settlement, Caleta de Sebo. There are no roads here and very few cars and place has a laid back sleepy charm. Then we'll board the catamaran again and start our voyage around the island. After sailing for around an hour we'll drop anchor at the idyllic beach of La Francesa where you can enjoy a dip or try some snorkelling or kayaking in the pristine turquoise waters. Meanwhile our friendly crew will cook up at traditional seafood and meat paella for you washed down with wine, beer and soft drinks. 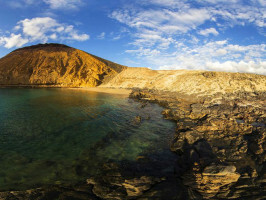 We'll continue our voyage, passing the incredible beaches of Las Conchas and Lambra. You'll also get magnificent views of some of the island's volcanoes before returning to Orzola where your bus will be waiting for you to take you back to your resort. 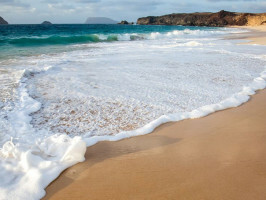 Playa Blanca 08:30 am, Puerto del Carmen 09:20 am , Costa Teguise 09:40 am. 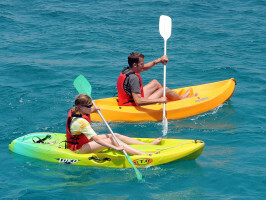 All transfers in Lanzarote, return crossing on glass bottom boat, Canarian snacks, Lunch with drinks (Paella), time in the village , time on the Francesa Beaches, fully guided excursions, kayaking and snorkelling. Graciosa at Leisure only includes bus and ferry transfers.